100 Oasis fans were treated to the first public playback of the new album, Dig Out Your Soul and a set by their returning heroes last night at a TV studio in London. The atmosphere was strangely informal - so much so that Liam's kids were running around the venue before the band took to the stage. After the album was played to the expectant crowd, Oasis wandered on without fanfare and launched into a string of hits including Rock 'N' Roll Star, Morning Glory and a new, countrified version of Don't Look Back In Anger, with Gem playing a revised lead guitar solo that brought the house down. The band didn't seem overly thrilled at the muted crowd reaction to some of the new songs, with Noel even asking whether they were "all on absinthe" at one point, but Liam was on fine, feral form all night. And his voice - often a cause of criticism on recent tours - seems to be back to its original potency. "Several tracks here, notably The Turning, Waiting For The Rapture, Falling Down and Ain't Got Nothin' will be part of the live set for years to come." Regardless of Noel's fears, his kid brother seemed to be in a good mood, and even wandering through the audience during the encore - a muscular, purposeful reading of Champagne Supernova. The few new songs we heard sounded better live than on record, and the band seemed feisty, confident and ready to embark on the first leg of what will no doubt turn out to be a mammoth world tour. A mid-tempo opener, the song builds into a relentless piano groove with Stone Roses-esque guitars at its core. And we're off. After the slightly underwhelming opener, The Turning is classic Oasis, and the first aural evidence of the 'Abbey Road' effect. Immediately recalling My Big Mouth from Be Here Now, but with two important differences: it's roughly 100 times better, and doesn't outstay its welcome by five minutes. The first genuine stand-out moment of the new album. A Noel-penned tune with almost Stooges-heavy guitars, choral backing and a relentless bassline. Already absolutely colossal live, and set to become a mainstay of the band's set for years to come. The first single seems to outline the mission statement of the whole album. Faster than expected, with Primal Scream-style production and propulsive, huge-sounding bass and drums, it's sure to be a hit. Planned as a second single, this ballad was written by Liam Gallagher. On first listen, we weren't overly impressed with this one, which seemed to go nowhere fast for five minutes and slowed the momentum built up by the preceding tunes. If ever a song on this album was destined to be labelled an oddity, it's this one. Similar in tone to The Importance Of Being Idle, this Noel-sung tale is another clear indication of the effort that's been invested to update Oasis' sound. The mix fizzes with inventive Sixties-referencing sound effects, but for all its effort, it still sounds like The Coral in a wind-tunnel. The Chemical Brothers gave this a ridiculously heavy remix for the b-side of The Shock Of The Lightning, but the band's original version is good enough to be a single in its own right. Sung by Noel, the lyrics see Noel worrying about "living in a dying dream", and once again, boasts self-confident, late-'60s-referencing production. Better than anything on the last album. Ah yes 'the groove'. Much was made of the band's attempt to adopt a looser sound based around loops and gradually evolving bass lines, and Gem's contribution is a strung-out mantra which ticks all of these boxes. A great, simple guitar solo lifts the song into a coda that's heavier than The Stooges in work boots. This fearsome three-minute stomp was penned by a belligerent Liam (is there any other kind) after an arrest in 2004, following a brawl in a Berlin bar. Imagine The Meaning Of Soul from Don't Believe The Truth, but with a proper tune and even more in-your-face sneering. Excellent then, really. An Andy Bell-penned track that immediately recalls A Bell Will Ring from Don't Believe The Truth on first listen. Another Liam contribution, Soldier On recalls Better Man and the Beatles I Want You (She's So Heavy) and clearly demonstrates that the button marked 'mantra' took a bit of a pounding during the recording sessions. Aims for epic, swaggering grandeur in the classic Champagne Supernova mould, but misses by some considerable distance. Overall, and on first listen, Oasis have made a sonically diverse, brave album that can only be the work of men confident in what they're doing. Several tracks here, notably The Turning, Waiting For The Rapture, Falling Down and Ain't Got Nothin' will be part of the live set for years to come, and will sound massive. 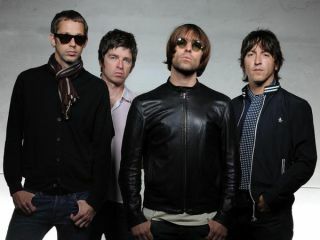 Noel's clearly 'avin that. In addition, Oasis have announced a full UK tour in support of Dig Out Your Soul. Tickets go on sale at 9am (BST) on Wednesday 20 August 20.